IOP 1B, 27 MARCH 2017: QLCS with bowing segments, areas of weak low-level rotation, and leading isolated cells. Best possible dual-Doppler coverage between VSE radars (not accounting for blockage, attenuation, etc. ), with baselines: < 25 km (green), 25-40km (yellow), and > 40km (red). Circles overlaid on radar locations indicate qualitative assessment of unblocked (green), partly-blocked (yellow), and heavily-blocked (red) data sectors at the lowest available elevation angles (0.5° or 0.8°). Single-Doppler velocity on 27 March at approximately 2104 UTC at the lowest antenna elevation angles (0.5° or 0.8°), from the VSE community radar facilities. These show overall data quality from each radar site. 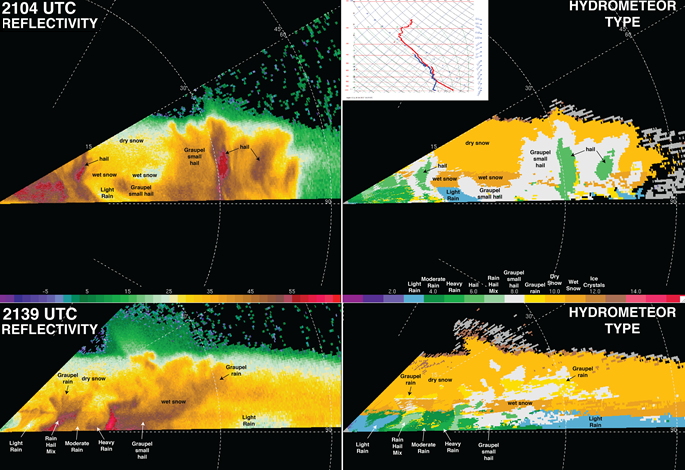 SMART-R reflectivity (left) and hydrometeor type (right) near dual-Doppler analysis time (top row) and later in storm evolution (bottom row), depicting evolution of hydrometeor type and distribution from predominantly graupel and hail to predominantly rain near/at the surface. 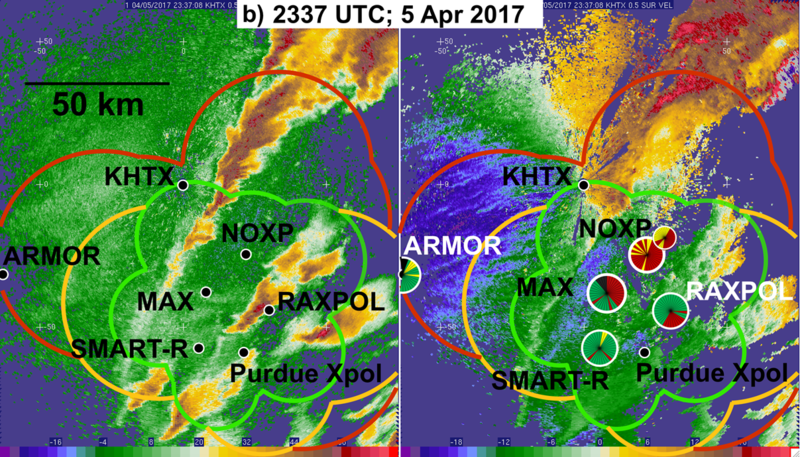 Left: Dual-Doppler low-level wind synthesis using SMART-R and ARMOR, showing low-level gust front, rear-to-front outflow, and areas of low-level rotation. Right: Dual-Doppler low-level winds integrated with TTU stesonet data. Wind in m/s; Potential Temperature in K. Time-to-space conversion is 5 min. IOP 3B, 5 APRIL 2017: Elongated cells leading a parallel-stratiform QLCS over Sand Mt. IOP 4C, 30 APRIL 2017: Weakening QLCS with small/weak bowing segments over Sand Mt.